Germany depends on the import of metallic, mineral and fossil fuel resources. The extraction of these raw materials takes place at the expense of the environment and leads to human rights violations. The German Federal Government has to take these consequences adequately into account. 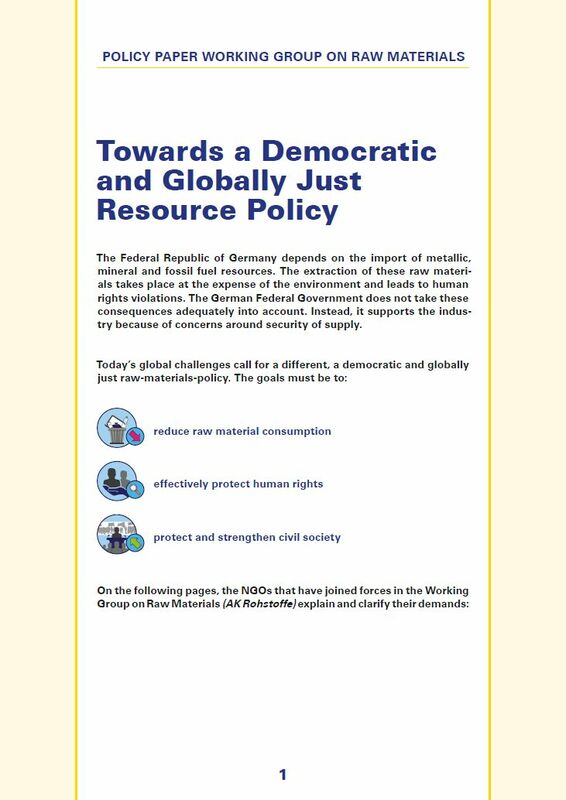 In the policy paper "Towards a democratic and globally just resource policy", the NGOs that have joined forces in the Working Group on Raw Materials (AK Rohstoffe) explain and clarify their demands. On a global level, patterns of consumption and production are ecologically not sustainable and lead to increasing social inequality. ‘Earth Overshoot Day’ marks the date on which humanity’s resource consumption for the year exceeds Earth’s capacity to regenerate those resources that year. In 1990, humanity had consumed one year’s resources on December 7th; ten years later, in 2000, November 1st marked this day; in 2010, it was August 21st and in 2016, ‘Earth Overshoot Day’ already occurred on August 8th. According to scientists at the United Nations Environment Programme, an equitable consumption of resources per person per year would be around six tons. In Germany alone, however, the total material consumption per capita currently figures at 40 tons per year. The debates on subjects such as the Internet of Things, Industry 4.0, Smart Home, electric mobility or non-recyclable produce from the chemical industry demonstrate that both industrial and economic policies do not take into account the rising demand for many raw materials. Instead, they count on efficiency savings, while ignoring planetary boundaries. At the same time, both precautionary environmental policies and the environmental management of enterprises still aim at decreasing environmental costs (so-called end-of-pipe technologies) rather than working towards an actual –and highly necessary – reduction in raw materials and energy use. Sufficiency, consistency, and gradual increases in raw materials efficiency by a factor of 10 belong to the most well-known and efficient measures for reducing raw material consumption. Tax incentives can promote investments in sustainable infrastructure, the use of secondary raw materials, and design concepts that build on reuse and easy maintenance. The Sustainable Development Goals (Goal 12 in particular) can help in putting these strategies into practice, and provide an impetus to action for the German Federal Government and the European Union. Germany has responsibility to respect, protect and fulfil civil, political, economic, social, and cultural human rights with regard to mining activities globally. On the one hand, this applies to both German companies importing metal and energy raw materials, and German companies having a share in resource projects or their financing. On the other hand, this applies to the German Government, which facilitates access to resources for German companies. This was precisely the purpose of the resource partnerships and agreements that the German Government has negotiated with Mongolia, Kazakhstan, Chile and Peru. Through instruments of foreign trade promotion, particularly guarantees for untied finance credits and Hermes export credit guarantees, the Government supports German companies in securing imports (mineral resources) and exports (mining, drilling or ancillary equipment). Within the framework of EU negotiations on trade and investment protection agreements, the German Government insists on abolishing export duties while simultaneously demanding far-reaching protective measures for German foreign investments. The UN Guiding Principles on Business and Human Rights stress the duty of states to protect society from violations of human rights perpetrated by companies. In a similar vein, the Guiding Principles highlight the companies’ obligation to respect human rights along the entire value chain. The Guiding Principles also stress the need for rights and obligations to be matched to appropriate and effective remedies when breached. Although the proposed EU regulation on due diligence for EU imports of tin, tantalum, tungsten and gold from conflict areas is a first step in this direction, it falls short in many respects. The focus rests solely on the financing of armed groups, whereas other acts within the context of mining that lead to human rights violations are not examined. Only first importers of ores and metals are covered, whereas the vast majority of companies that use these raw materials – such as the car and electrical industry – are absolved from responsibility. To make matters worse, companies must primarily report on their methods of implementing due diligence, but not on the identified risks themselves. So far, the proposed legislation does not foresee any measures to impose sanctions against companies that conduct no or poor due diligence. An active civil society is crucial for exposing human rights violations and environmental destruction in mining areas; for advocating the interests and participation of communities affected by mining; and for holding human rights violators to account. However, civil society’s space for action is increasingly being diminished worldwide. NGOs, activists, and human rights defenders who deal with the human rights, social and ecological impact of mining projects are being increasingly intimidated, criminalised or even assaulted. More and more of our colleagues assume the risk of being murdered. 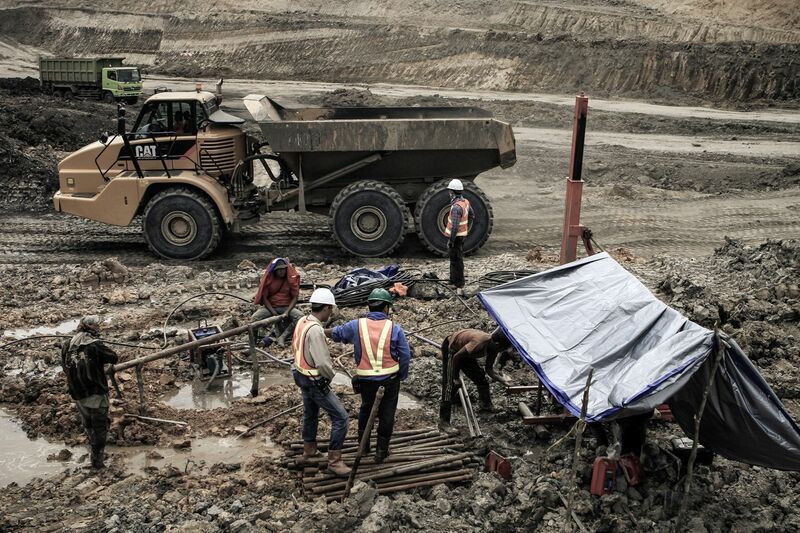 Mining projects often occur in regions claimed by Indigenous Peoples, and are synonymous with the displacement of local people from their ancestral lands. ILO Convention 169, which confirms the essential role of Indigenous Peoples in decisions concerning their territories, has still not been ratified by Germany. The German Government’s resource policy has considerable influence on the conditions under which resources in the Global South are mined. The framework for these activities, however, is mostly established in opaque committees and proceedings. Trade associations have privileged access to resource policy decisions, from which civil society is excluded. D-EITI (the German implementation process of the Extractive Industry Transparency Initiative) is a process for ensuring transparency of cash flows in the extractive sector. Civil society is integrated into this process, and as such it should not be decoupled from other current debates on resource policy. The policy paper from the Working Group on Raw Materials (AK Rohstoffe) "Towards a democratic and globally just resource policy" is available for download.